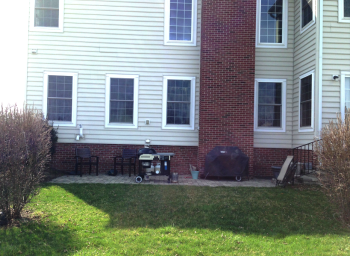 When our New Albany client purchased their home, the backyard left a lot to be desired. 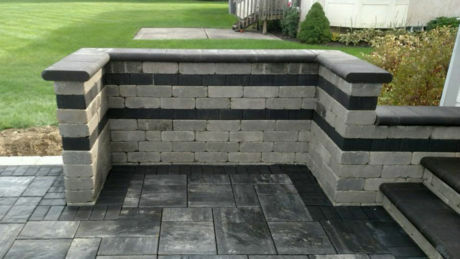 The original owner had apparently hired a cut-rate contractor to install a paver patio and steps, which after a few years were literally falling apart. At our first appointment, the homeowner lamented that they rarely used the backyard and were actually embarrassed to let people see it. 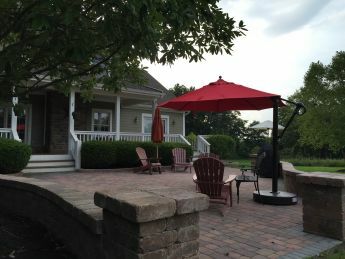 The overgrown shrubs surrounding the patio made it feel cramped and closed in, and there was only a single light on the back of the house which left the area pitch-black after the sun went down. 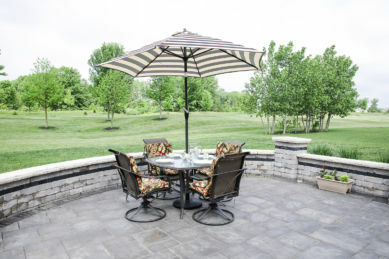 They longed for an area to host small gatherings, spend family dinners, and prepare food on one of their specialty grills. 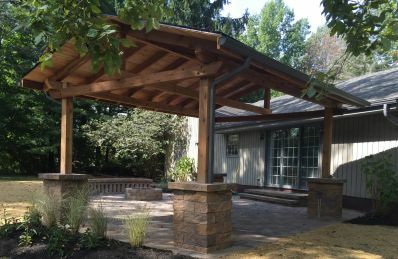 Their wish list included more space, a gas fire feature, some built in seating, and a pergola. However, they had one [big] problem. 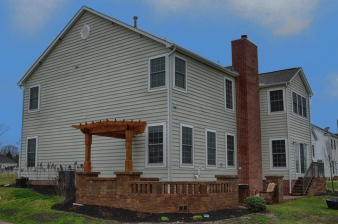 When they bought their house, they didn’t realize an easement that ran through their backyard left them very limited space that they were allowed to build on. 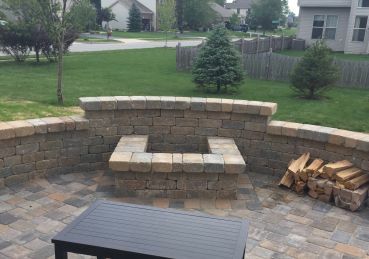 They had met with other outdoor living contractors in the past, but no one really wanted to deal with their challenging situation. Then ProScape stepped in. From their lemon of a situation, we found a way to make some lemonade, through some really creative thinking by our landscape design team. Though it took some special engineering and outside-the-box solutions, we were able to give them everything on their wish-list. 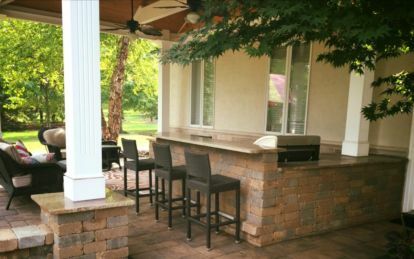 We maximized every inch of space possible to give them a beautiful and versatile space that included some really cool features like a “disappearing” gas fire feature, built in benches, a beautiful custom cedar pergola, tasteful LED landscape lighting, and an ornate custom aluminum railing. 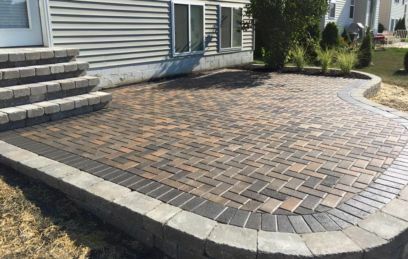 When we initially looked at the paver patio project, we also discussed new landscape plantings and landscape lighting around the remainder of the home that would likely be a secondary phase. 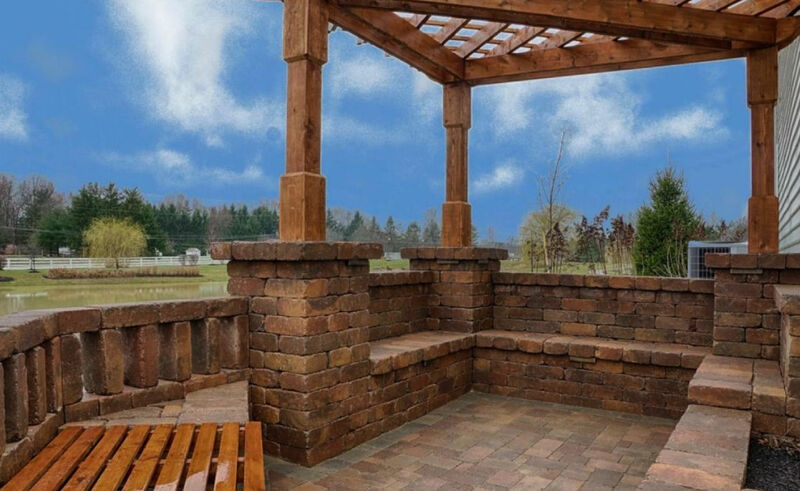 However, once this ProScape client saw our 3-D renders and walk-through video, they loved how the landscape and hardscape elements flowed together so well that they decided to have us do everything at one time! 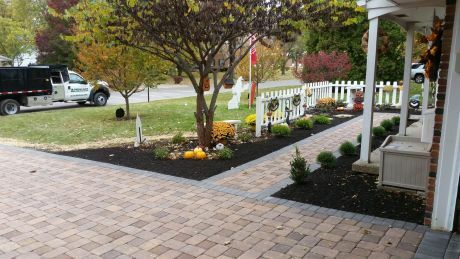 Our team came in and performed the extensive renovation in only 3 weeks and cared for every detail of the project down to grading and seeding the lawn and ensuring that the drainage and irrigation was re-routed and functioning properly. 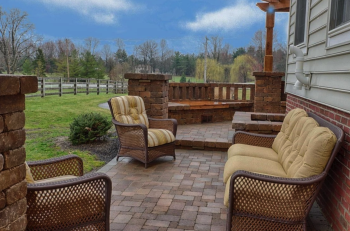 Do you long for a beautiful backyard or do you have a landscaping challenge that needs solved? We would love to help you turn your dreams into reality! Contact us today for a free property evaluation. "From the very first meeting, the ProScape team became personally invested in our project, providing an experience and finished project that was beyond what we ever imagined. 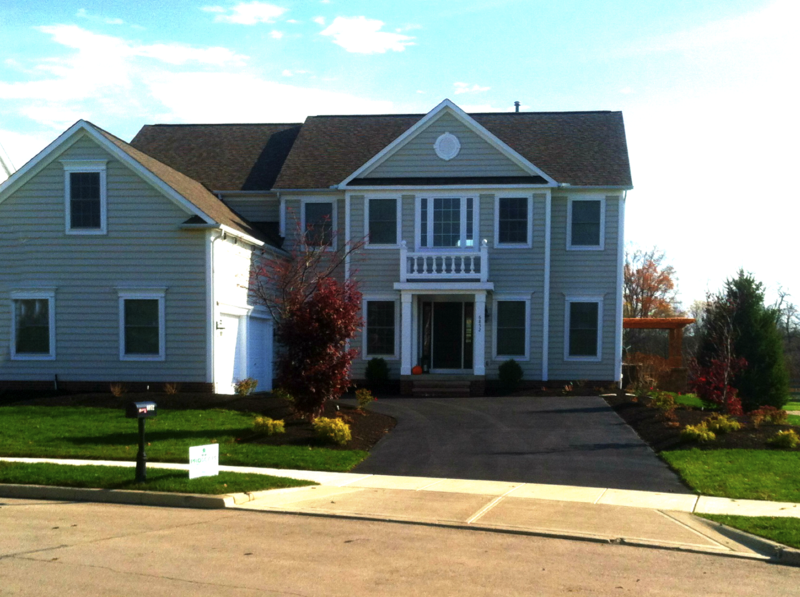 The crews that worked at our home were efficient, neat, and polite. A couple times when unforeseen issues arose, communication was prompt and the resolution was professional. We can finally love our outdoors!"